Fig.1. Bufonite as depicted in Ulisse Aldrovandi's "Musaeum Metallicum" (1648). This Bufonite seems to be some sort of concretion or possibly a Bezoar-stone. The Bufonite / Botrax / Borax / Batrachite / Chelonite / Brontias / dragonstone or Lapis Bufonis / toadstone is a particular form of gemstone that grows in the brains of toads, most often after various toads jumped on the head of the king of the toads. Two kinds of stones exist, one is white, the other black - they differ significantly in their magic properties. 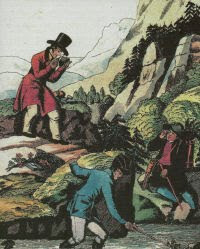 The stone must be recovered by putting the toad on a red blanket or by exposing the animal to heat - it will then regurgitate the stone, now you must quickly take it or otherwise the animal will swallow it again. Ants can also skeletonise a dead toad and expose the stone. Fig.2. 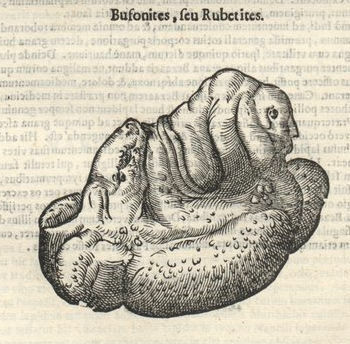 A 1497 illustration by the German botanist and physician Johannes de Cuba, depicting the extraction and use of a toadstone. The stone protects from magic and misfortune, has healing powers for all sorts of wounds and interior pains. In the vicinity of poison its change its colour and starts to transpire a liquid. Despite the vague descriptions that exist for this magic gemstone, "toadstones" were identified with the fossilized teeth of Lepidotus - an extinct genus of ray-finned fish from the Jurassic and Cretaceous periods - probably due the supposed similarities of the fossil teeth to the eyes of the toad. Fig.3. 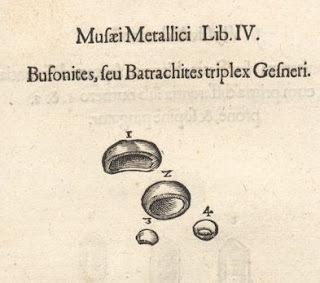 Another kind of Bufonite as depicted in Ulisse Aldrovandi's "Musaeum Metallicum" (1648), these are clearly the fossil teeth of the fish Lepidotus. Round these parts (Derbyshire/Staffordshire, UK) toadstones are basaltic lavas in the Carboniferous Limestone sequence, described well before their igneous origin was properly understood. Possibly derived from the German todter stein or 'dead stone' (barren of lead/zinc ore).